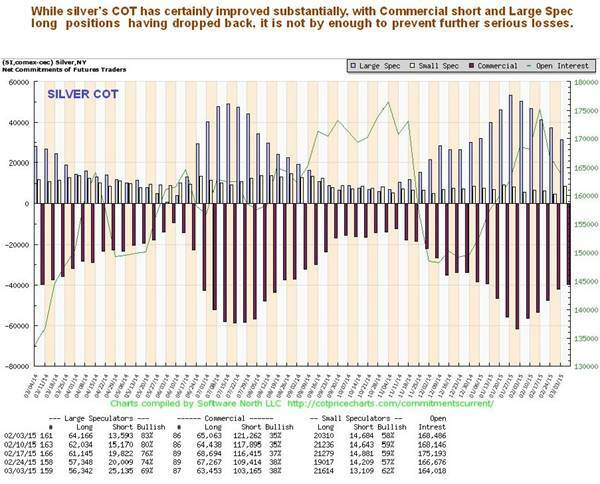 Silver remains stuck in a bear market and looks set to make new lows soon, for the same reasons as gold: gathering deflationary forces and continued unwinding of the global carry trade leading to a continuation of the dollar spike, which, as set out in the Gold Market update, could see the dollar index reach as high as 120 and in extreme circumstances even higher. 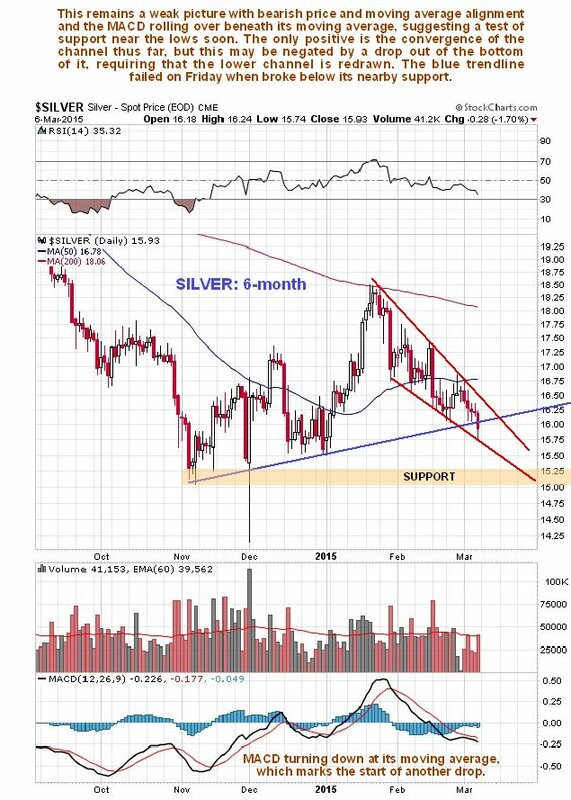 On its 6-month chart we can see how silver broke lower again on Friday, beneath potential trendline support at the same time as gold breached a support level and dropped sharply. The overall tone of this chart is negative with the price beneath both its main moving averages, which are bearishly aligned. We can identify the larger pattern clearly on the 8-year chart on which we can see that the price remains within the confines of a steady downtrend from the highs in 2011, which shows no signs of ending. The rally early this year failed at a former important support level that is now resistance and at its falling 200-day moving average, which failure points to new lows ahead. If the dollar index continues to rally strongly – and the current move has an immediate target at 102 – silver could easily drop to contact the lower boundary of its downtrend channel, meaning that it could drop below $12. 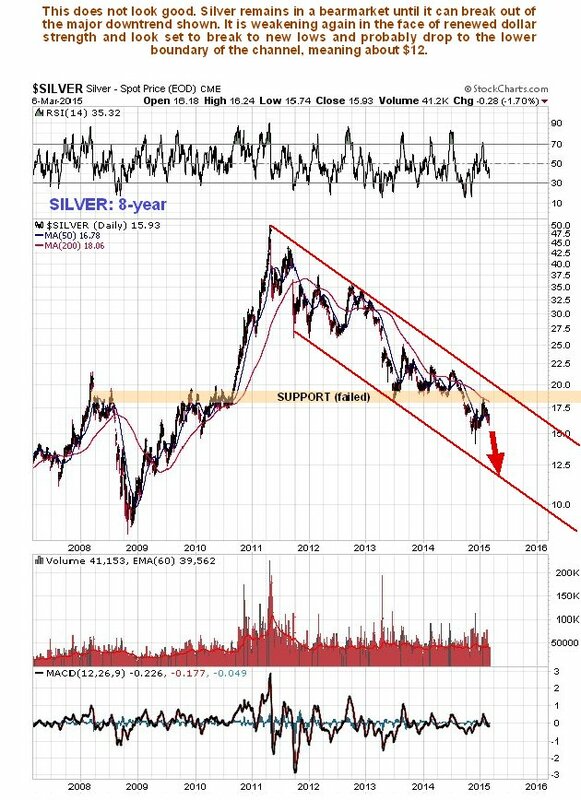 To start looking positive again, silver has to break out of this stubborn downtrend channel, and there’s no sign of that happening at the moment. 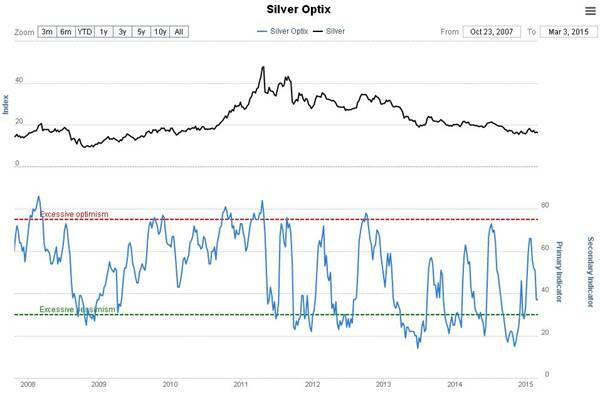 The Silver Optix, or optimism chart, is similar, but nearer to being bullish. However this will not provide much relief if a general deflationary downwave strikes, as looks likely very soon. 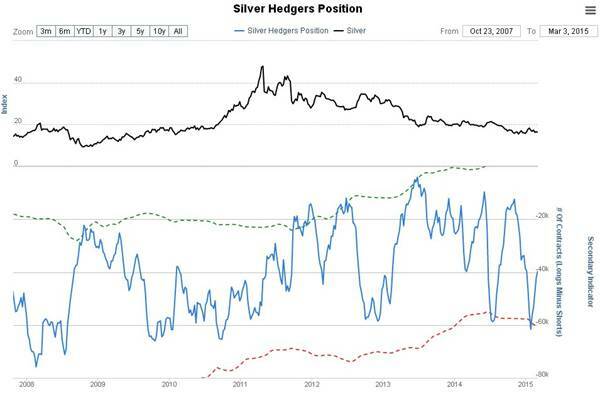 Silver underperforms gold during PM sector bearmarkets, resulting in a downtrend when silver is plotted over gold, as can be seen below. A breakout from this downtrend will be an indication that the sector downtrend is over, but as yet there is no sign of it. 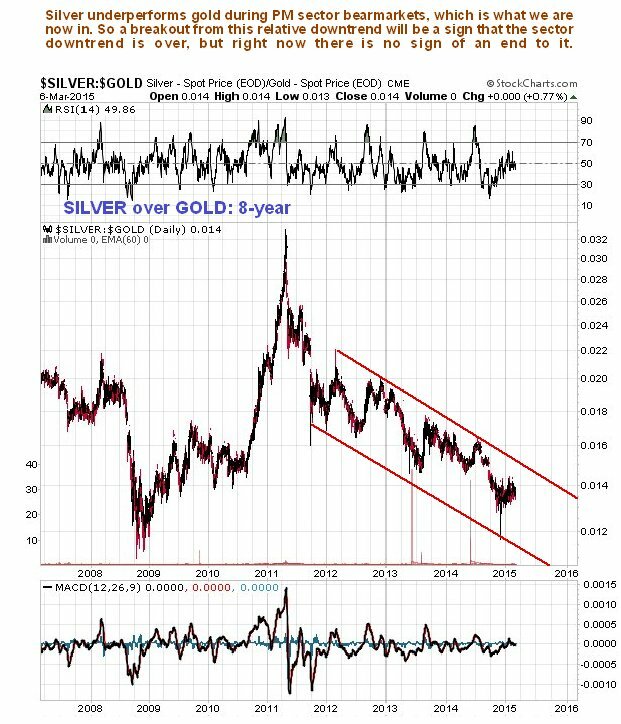 Finally, please note that much of what is written for gold applies equally to silver, especially the analysis for the dollar, and it is not repeated here.